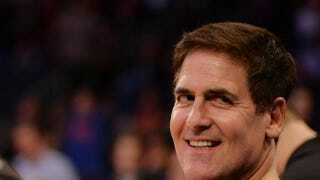 While the NBA is still reeling from embattled Los Angeles Clippers owner Donald Sterling's racist rant that was caught on tape, Dallas Mavericks owner Mark Cuban may have added some more fuel to the fire. Speaking at the annual GrowCo conference, a startup-meets-successful-company-representatives gathering on Wednesday in Nashville, Tenn., the outspoken Cuban warned the audience that he planned to go "full Mark Cuban" on them and apologized in advance for anyone who might be upset about the profanity he might use, Tennessean.com reports. Cuban was participating in an onstage interview that included a range of topics. When the conversation turned to bigotry and Donald Sterling, Cuban had this to say: "I know I'm prejudiced, and I know I'm bigoted in a lot of different ways. If I see a black kid in a hoodie on my side of the street, I'll move to the other side of the street. If I see a white guy with a shaved head and tattoos [on the side he is on], I'll move back to the other side of the street. None of us have pure thoughts; we all live in glass houses," Tennessean.com reports. The timing of Cuban's comments may be hard for some to swallow, considering that the NBA is still in the throes of handling the Sterling scandal and just a year ago, "hoodies" and "black kids" became a national discussion after Florida teen Trayvon Martin was gunned down while wearing a hoodie. The NBA allowed Miami Heat players to wear hoodies in a team photo to protest the shooting. Cuban, who is part of the league of owners who will vote June 3 on whether or not Sterling gets to keep his team, told the audience that he has decided which way he will vote but isn't ready to speak on it. He did add that he believes voting Sterling out of the NBA is a "slippery slope" and feels that he may come off as a hypocrite in voting on whether or not Sterling gets to stay. When asked about keeping bigotry out of the NBA, Cuban said: "You don't; there's no law against stupid. I'm the one guy who says don't force the stupid people to be quiet. I want to know who the morons are."